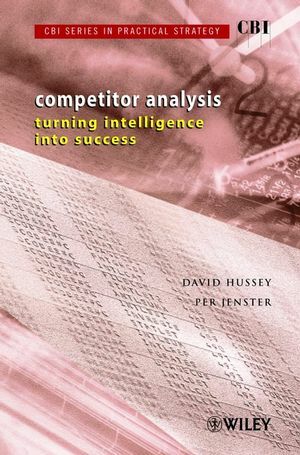 This book provides a comprehensive guide for marketing and planning practitioners, managers and management consultants to enable them to improve the competitor information and intelligence available to their organizations, and to use it to gain advantages over the competition. Competitor Analysis: Turning Intelligence into Success goes beyond the broad concepts, and gives practical advice on how to obtain and use the necessary information, offers strategies for both attack and defence. The text builds on a sound conceptual foundation, and draws heavily on the author's practical experience. DAVID HUSSEY is a well-known international authority on strategic management, with experience as both a practitioner in and a consultant to major companies from many industries. He was 18 years with Harbridge House (14 years as Managing Director of Harbridge Consulting Group Ltd). He is author or editor of over 25 books on strategy or management development. One of the founders of the Strategic Planning Society, and a director of the Japan Strategic Management Institute, he is currently visiting professor in strategic management at Nottingham Business School. He is former editor of the Journal of Strategic Change. His current interests include the development of practical strategic analysis methods, and improvements to the process of implementing strategic decisions. PER V. JENSTER is Research Professor at the Copenhagen Business School, Denmark, and Associated Director of Company Programs at the Center for Industrial Management Industrial Development, Lausanne, Switzerland. He was previously Professor at the International Institute for Management Development (IMD), where he was Director of IMD's Managing Industrial Market Strategy program. He holds a Cand.Oecon from the University of Aarhus (Denmark) and Ph.D in Strategic Management and Information Systems from the University of Pittsburgh. He is the author of six text books dealing with strategic management and industrial marketing, and numerous articles and case studies within the strategy and marketing area. His research interests lie in outsourcing and facility management by industrial firms and supply chain management. The Foundations for Competitor Analysis. Key to Understanding the Competitive Arena. Using Critical Success Factors in Planning. Understanding Competitors: Methods of Analysis. Sources of Information for Competitor Analysis. Competitor Analysis in Practice: A Case History. Assessment of National Competitiveness: A European Example. The West European Car Rental Industry.